With an abundant array of bright red, yellow and purple flowers, this arrangement is sure to please. 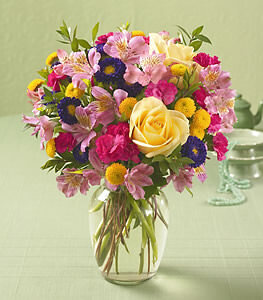 Alstroemeria, asters, carnations and chrysanthemums are delivered in a cheerful clear glass vase. Your team is always polite and very dedicated to being of service: as I live outside of the U.S. and have needed to get flowers to friends and family who do not have regular schedules - they have always looked for ways to ensure that my order arrived and subsequently followed-up to make sure I knew what actions had been taken.